While a solid referral can be the key to getting hired, anyone who knows you well enough to vouch for you probably wouldn't do it for, like, $1000. Then again, a stranger probably would. And henceforth, JobPrize. Just-launched in beta, JP's an online job referral service allowing unemployable shmos to pay those in enviable workplaces to land them an interview that leads to a job, and guess who's cashing that job's first paycheck. 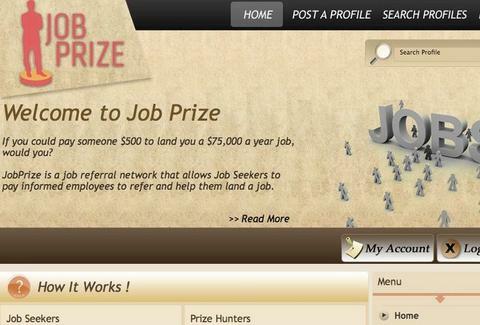 Seekers fill out a profile (employment they want, min salary, etc), attach their resume, and set the amount they're willing to pay for the hook up; "Prize Hunters" with inside knowledge of openings can then contact them through the site, and should they successfully set up a meeting, the cash is dropped into a JP-administered escrow account that's only delivered upon hiring, which by then will provide little solace for the fact they'll have to work with you every day. Some just-added listings include a "Media Designer" offering $500 to anyone who can secure them a job at a "stable media company"; an engineer willing to shell out $350 for a gig that will "pay at least $4000 a month" to work online; and a guy also willing to drop $350 for anyone who finds his wife a pharmaceutical job in Connecticut, though her prospects remain Merck-y. JP's currently working to secure corporate partners to directly recruit from the site, meaning seekers wouldn't end up paying anyone to recommend them, saving you $1000 you can earmark towards getting someone to "know" you.